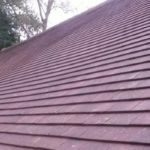 Flat Roof Cost - What is a Fair Price to Pay in 2018? Is your flat roof leaking and in need of replacement? We explore the three most popular options on the market today and their approximate costs. We even have a separate guide to the pros and cons of different roof coverings. Insulation – do you need it to meet new Building Regulations? If you have no idea which flat roof covering is best, you should first go and check out our guide to flat roofs where we explain the pros and cons of each option. The best thing you can do to ensure the finished flat roof will last as long as possible is to make sure any rainwater discharges off the roof and into the outlets or gutters without pooling on the surface. Any pooling of water will lead to a build up of algae, sediment and mosses that can affect the surface materials, potentially shortening the life expectancy of the product. If your existing flat roof is holding water due to the underlying decking suffering from rot then the solution is to replace the decking boards. If any water retention is due to poor construction of the structure and water flowing in the wrong direction, the solution is to install firrings as well as new decking boards. 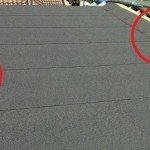 Both of the above options will add extra cost to the flat roof work. This type of roofing felt has been in use for decades and is still popular today. Layers of felt are torched onto each other to form an impenetrable barrier. The price above included new decking that may or may not need replacing. If you want to know the “supply only” price of all the materials needed for a single garage roof, check out the information below. Different suppliers will charge differing prices, but this should suffice as a guide for good quality felt. Assuming you only need the felt replacing with a 2-layer system (often used on garages and sheds) – £775 inc VAT. For a 3-layer felt only system (required over habitable and insulated areas of the house) – £850.00 inc VAT. For a complete replacement including new decking boards with a 3 layer system – £1200.00. Add £50 for firrings if needed. We haven’t included the cost for replacement guttering, fascias or soffits. Also, additional insulation may be needed on some flat roofs to meet current regulations. Don’t forget; our breakdown of the flat roof costs are for a single garage roof. What About a Double Garage? The price breakdown shown above is for a single garage. A double garage with a 3-layer system and new decking usually costs around £2000.00 inc VAT. There are several different types of Epdm material and as with any other type of felt, the weak point is the joints. That’s why we prefer the one-piece rubber membrane as it doesn’t have any joints and in our opinion is less likely to leak in the future. Waste disposal, decking, fascias, guttering, building control notification etc as extras if needed. There is a very helpful flat roof calculator at Rubber4Roofs where you can input the dimensions of your flat roof and get a price, including all the edge trims and adhesives. Fibreglass has also been around for decades but isn’t as popular on flat roofs as it once was. The work takes longer to complete and in most cases, you need new decking boards as well. Maria (London) The flat roof is torch on Bitumen with torch on flashing, this roof has been patched repaired previously, torch on felt roofs have an approximate life span of 10-12 years merely as a covering. We would recommend a different covering such as GRP fibre glass. You can see the full table and give us your prices for a new flat roof by visiting this page (no email required). 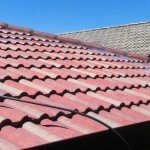 There are pros and cons to each material and while a good roofer would understand this and offer you the best options for your budget, this industry is unfortunately filled with unscrupulous traders. We have created a very helpful flat roof guide that is targeted to beginners and those with very little knowledge of this subject. do I really need to replace the decking underneath the roof covering? which will last the longest? what type of flat roof looks the most appealing? 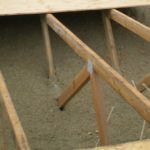 do I need extra insulation? 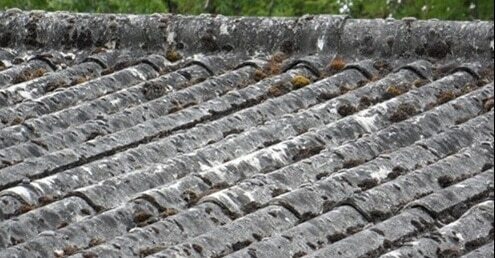 What About Asbestos Flat Roofs? Asbestos was a popular material used in the construction of roofs up to 1999 when it was finally banned. Unfortunately, there are still millions of homes that contain Asbestos at least somewhere. Just to confuse matters, there are several products on the market that look identical to Asbestos but in fact, don’t contain any of this dangerous material. The photo below is of non-Asbestos fibre cement. So if you are in doubt about which material is on your roof, have a sample taken and tested, it doesn’t cost that much. We don’t recommend replacing Asbestos sheets with non-Asbestos sheets for any type of roof except those on industrial or farm buildings. For most types of Asbestos, it’s generally considered safe provided that the material isn’t disturbed. For those of you that are considering a new flat roof and need to remove this material, we have created an Asbestos removal cost guide that includes some examples from Asbestos removers. You’ll need to add this cost to any price you receive for a new flat roof. See our Asbestos removal cost guide here. 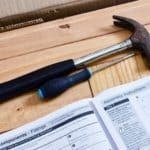 Insulation – Do You Need it to Comply With Building Regulations? 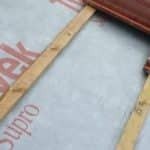 Since 2005, if you replace 25% or more of your roof covering (felt) then you need to ensure that the entire flat roof has enough insulation to satisfy current building regulations. This only applies to flat roof over habitable parts of your home, not separate garages or sheds. There are several insulation options available but they do come at extra cost. Visit our impartial guide to flat roofs for more information. 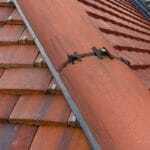 What About Minor Flat Roof Repair Costs? 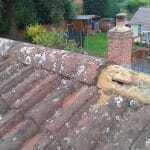 Patch repairs are possible if the flat roof is damaged due to an impact, perhaps a slipped slate or tile etc. 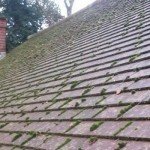 However, if the roof has a leak due to its age then patch repairs are a false economy and not worth trying, you could make the roof leak worse by walking on it and cutting in a patch. It’s impossible to predict the cost of a patch repair without first inspecting the roof. Smaller jobs are notoriously difficult to estimate without looking at roof in more detail. 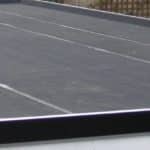 We would suggest a price of between £100 and £150 for a small patch repair to a bitumen felted flat roof that has a tear, we assume that the decking or underlying roof structure isn’t damaged. VAT – Can You Avoid Paying This Tax? As you can see from our prices displayed above, VAT accounts for a significant amount of the total cost. Smaller firms that are trading below the VAT threshold do not to charge you this tax on their labour and profits. Read our guide to legally avoiding VAT here. We have done our best to dig into the costs you can expect to pay for a new flat roof. However, our price guides are not a substitute for a fixed written quote that is provided after an inspection and measure-up of the roof. Our partner can help you source quotes from a pool of reviewed and rated roofers that are registered on their website. A single garage roof without decking will take about 4 hours. Removing and replacing the decking and you can expect the work to take around 7 or 8 hours. A double will take a day if you only replace the felt, with the decking too, allow a day and a half. The built up system should have 3 layers but on sheds and detached garages many roofers will offer the option of two layers. The epdm "one piece" membrane is fairly easy to install but would still be best suited to someone with good carpentry skills. Torched on felt and fibreglass should be left to experienced contractors. Building control will need to be notified before and after the project if you intend to replace 50% or more of a roof. The cheapest way to accomplish this is to employ a roofer that is a member of the "Competent Roofer" scheme. Members pay a joining fee of around £500 and a yearly renewal of £500. This allows them to self certify their work at a cost of around £50 per project. When replacing a felt roof, the void between the felt and the ceiling will need to be checked for insulation. If there isn't any or it's not enough to meet regulations, extra insulation will need to be installed. There are various options available but the most popular is a foam-like board sandwiched between the decking and roof rafters.